//	Will OnePlus 3 and 3T Security Concerns Persist After Oxygen OS 4.1.7 Update? Will OnePlus 3 and 3T Security Concerns Persist After Oxygen OS 4.1.7 Update? OnePlus 3 and 3T users have the opportunity to get a limited edition of the Oxygen OS 4.1.7 Over The Air (OTA). The update promises to fix problems related to security, apps and some features. Some of the improvements included in the update include optimization of the battery and Bluetooth features, touch latency and the August Android security patch. In the past, the operating system had bugs in the sound channel, which caused audio errors whenever video was being recorded. Third party apps were also not being featured well in the app locker. The “Screen Off” gesture was also turning on the display on whenever a user was making a phone call. There was some confusion on whether the update would address the touch latency problems but the OnePlus co-founder Carl Pei, has allayed those fears in a Tweet where he confirmed that the update will fix the issue. The Oxygen OS 4.1.7 update was rolled out to a limited number of users over the air, and a larger rollout in the next few coming days. Users owning the OnePlus 3 and 3T will have to wait for a few days before they get the update on their phones. Users who cannot wait for the OTA version can manually install the update by going to the settings on the phone. As far as the Android OS is concerned, OnePlus will not offer any more updates after the Android 8.0 Oreo update. The company will only give support for the Oreo update for a period of one year, after which no support will be provided. The limitations placed on the number of updates and support to be availed has caused jitters among users. They feel that their phones will be vulnerable after that one year has expired, and OnePlus is yet to comment on these fears. Recent announcements that the company is looking to roll out the new Oxygen OS 4.5 for the OnePlus 3 and 3T should water down any fears that users may have. The update is scheduled to be rolled out a month or two after the August Android security patch has been released. This means that the new OS will be available in October. Google has requested for the exclusion of Google Hangout in the update, so users who want to keep it must update to the most recent version before updating Oxygen OS. In other news, OnePlus has released the OnePlus 5, which will be sporting a Snapdragon 835 processor. The device has a 5.5 inch Full HD display, 6GB and 8GB RAM variations and 64GB and 128GB storage space options. The device will also feature a dual camera setup at the back. As with any other update, the Oxygen 4.1.7 OS update may have raised a few fears, especially because it will not have further updates or support after August 2018. However, these fears need not arise, given that the update has addressed issues that have been raised by users in the past. 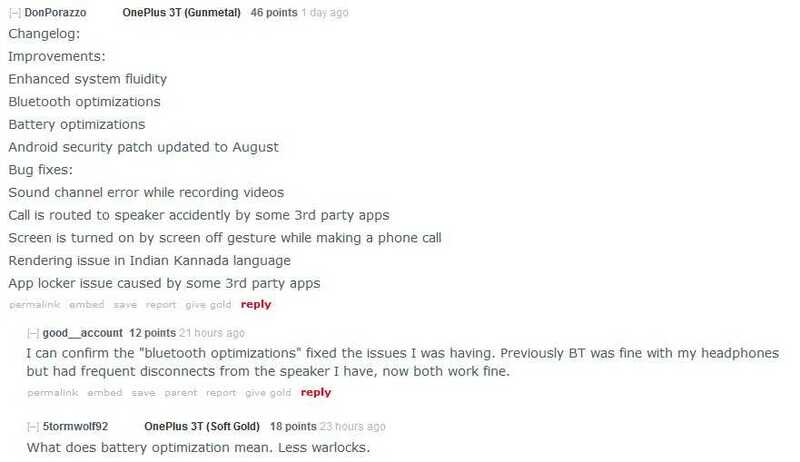 OnePlus is glad that users give their input and enable the manufacturer to improve their OS and handheld devices too.